Pisa Leaning Tower - Why is Pisa tower leaning? "Pisa leaning tower...you could pretty much call it the super- star of cathedral bell towers!" But there is one Cathedral bell tower that everyone in the world knows of. You could pretty much call it the super- star of cathedral bell towers: it’s the Pisa leaning tower! 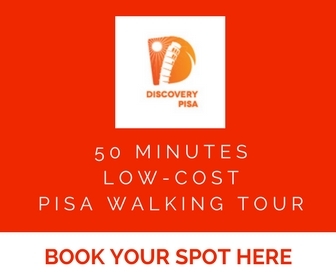 If you're planning a visit to Pisa, and you have already booked your transportation there with Tuscanybus.com, then you should also look into getting a spot on the cruisers-only budget tour of Pisa by Discovery Pisa Guided Tours. Their deal is too good to miss! And it can even include climbing the tower itself! But they had one enemy as well… the Florentines. To show off their strength and wealth to the Florentines before anything else, the Pisans decided to build a magnificent cathedral. As it was custom back in the time when a town’s success was measured by the splendour of its cathedrals and the height of its bell towers. But then something went wrong… due to the fact that it was built on marshy ground and that the foundations were too shallow, by the time its construction reached the 3rd floor, the tower started tilting. The construction of the leaning tower of Pisa was being interrupted every few years because of warfare, so from the moment when the first stone was set to the moment the tower was finished, it was around 150 years that passed. And… it took another 30 years to finally put the bell tower on top, in 1350. But by the time the Pisa tower was finished, the Pisans had no reason to show off anymore: they lost in the war against Genoa and a century later, the town of Pisa was sold to their worst enemy… Florence. DINING-ROOM TABLE TIDBIT: Legend says it was from the top of the Pisa leaning tower that Galileo Galilei experimented with gravity. Allegedly, from there he dropped 2 cannon balls of different weights to prove that their speed was not the result of their mass. So, what did the people of Pisa do when they noticed the Pisa bell tower became the Pisa leaning tower? Well, when they got over one of the biggest embarrassments of architecture history, they tried to correct the tilt of course. So they started building each new storey a bit higher on the tilting side, to make up for the difference… but the effect was even worse – due to all that extra stone, the Pisa leaning tower started leaning even more! By the 20th Ct, the Pisa tower was leaning more than 20 feet south, and a rescue effort began… the engineers had to remove the soil from the northern side to even it out as much as possible. Due to the work on it, the Pisa tower had been closed from 1990 - to 2008 because of safety fears! The restoration lasted 11 years and $27 million later the lean was reduced by 15 inches. DINING-ROOM TABLE TIDBIT: Some engineers say that Pisa leaning tower shouldn’t be moving anywhere for the next 300 years but others say it is still sinking about 0,03 inches (1 mm) each year. Today, the Pisa leaning tower is located north from the center of Pisa, in the middle of the Piazza dei Miracoli (The Field of Miracles), which is the largest preserved monumental complex of the Medieval world and a UNESCO World Heritage site. It is one of the most visited monuments in the world, it’s almost as if we cannot believe it defies gravity until we see it for ourselves! 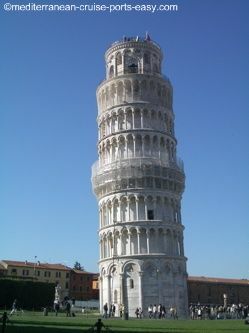 You can read more about getting to the Pisa leaning tower in our article Getting to Pisa tower. But the absolutely best way to get to it is to take one of the Tuscanybus.com buses to Pisa and then taking the Discovery Pisa cruisers-only budget tours the beginning of which correlates to their buses' arrivals. Their guides will literally walk you from the bus to Piazza dei Miracoli. Pisa is many a cruisers’ stop on the way to or from Florence Italy, but that’s only if you don’t plan to climb the tower. If you just wish to take a few photos of you propping up the tower and have a little walk around the Cathedral and the Baptistery, less than an hour in Pisa is enough! If you think it would be really cool to have a pizza in Pisa, our recommendation will be… don’t! If Pisa is your only destination for the day and you really wish to climb the tower, make sure you read our article on taking a cruisers-only budget tour of Pisa, it's the best, stress-free way to see Pisa and can include climbing to the Tower of Pisa.